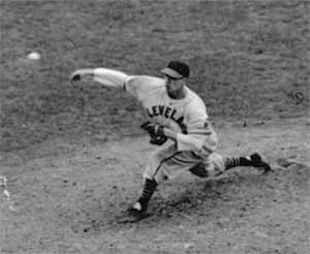 Note to readers: The late Bob Feller, who died Wednesday at age 92, threw blazing fastballs during what now is one of baseball's many bygone eras. Before retiring in 1956, the first-ballot Hall of Famer pitched three no-hitters and an amazing dozen one-hitters for the only team he ever played for -- the Cleveland Indians. I interviewed Feller nearly 31 years ago at a Hurst shopping mall, where he served as the lone ringmaster for a traveling Hall of Fame exhibit. I can still see him playfully throwing a baseball off the brick wall facade of a shoe store, prompting its owner to demand a stop to it. Some people just don't know how to have fun. This article originally was published on Feb. 9, 1980. R.I.P., "Bullet Bob." HURST -- When he was a major league pitcher in his prime, it was said Bob Feller could hum his fastball through a brick wall. "I wonder how my arm is today?" he said 24 years after he threw his last bullet for the Cleveland Indians. It still was good enough to lob a rubber ball high off a brick wall above a shoe store at North East Mall. The ball rebounded back into the fenced Gillette/Baseball Hall of Fame Exhibit, where it was caught by the paunchy 61-year-old man wearing a double-knit Indians uniform and a pair of soiled, white tennis shoes. When it comes to baseball, Feller still is a big kid in a golden-ager's body. He knows the game like the back of his huge, gnarled pitching hand and he encourages others to wallow awhile in baseball nostalgia. Occasionally, he sounded like a carnival barker on this slow business day at the mall: "C'mon in folks, see the Baseball Hall of Fame. It's all free!" Which it wasn't for visitors seeking Feller's autograph. "If you want to buy a Hall of Fame book for three bucks, I'll sign anything you've got," Feller told a young man carrying two hardback baseball books that he wanted autographed. The visitor initially objected on "principle," but later he grudgingly bought a souvenir in return for Feller's scrawl. For $5, collectors of baseball memorabilia can have their picture taken with Feller in front of Babe Ruth's locker, which contains the slugger's uniform, spikes and bat. This is the first time that mementos from the Cooperstown, N.Y. exhibit have been taken on tour; proceeds from souvenir sales go to the U.S. Olympic Committee and the Hall of Fame building fund. "I only sign things that I sell," Feller said. "If we do it for free, we're liable to go home with nothing but our tails between our legs." There's a lot to see for nothing. Connoisseurs of the National Pastime can see the starched jerseys of Mickey Mantle, Willie Mays, Jackie Robinson, Ty Cobb, Cy Young and Stan Musial. There is a ball hit into the bleachers in 1911 by the so-called Frank "Home Run" Baker, who belted only a dozen of them in his best season. Lou "The Iron Horse" Gehrig's first baseman's mitt is on display alongside outfielder Joe DiMaggio's flycatcher. The exhibit also includes World Series rings, famous home run hitters' bats and no-hit baseballs. Feller threw three no-hitters and 12 one-hitters before retiring in 1956. In 1976, baseball's centennial year, he was named the game's "greatest living right-hand pitcher." The raves about his pitching arm haven't gone to his head. As host of the Hall of Fame exhibit, Feller treats children like budding All-Stars and obligingly "chews the fat" with old-timers who remember him when. "Whaddya say there, active guy?" he asked a pre-schooler. Talking shop with a member of his own generation, Feller pulled out a baseball encyclopedia and pointed to an obscure former player named Walter Schang. "He was my first roommate," Feller announced. When he was throwing strikes for the Indians, most of his fellow pitchers "were brought up in a rural area on a farm with a lot of manual labor," Feller said. "That was a great asset to build up your stamina, living that kind of life." Feller was a farm boy in Iowa and his vocabulary often is sprinkled with the sayings of what now seems an ancient era and lifestyle. During one of the frequent lulls at the exhibit Wednesday afternoon, he decided to "go relay myself a hot dog." But there was no vendor yelling, Red hots!" So Feller settled for a fast-food hot dog stand. Baseball, he said, is 'kind of like an island of solidarity." Standing amid the exhibits during the dinner hour, he was for a while the only man on that island. "Well, let's see, everybody get the cows milked and secure everything at the ranch and come zooming in here," he suggested. 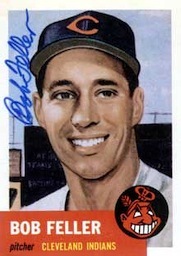 A few minutes later, a youngster with awe in his eyes asked, "Are you Bob Feller?" "That's right, the one and only," he replied, extending his hand and relishing the moment.